7 panel folding display boards are a comprehensive tool for displays and exhibits. These display boards are designed to be easy to use whilst incorporating high quality materials to create a professional finish. 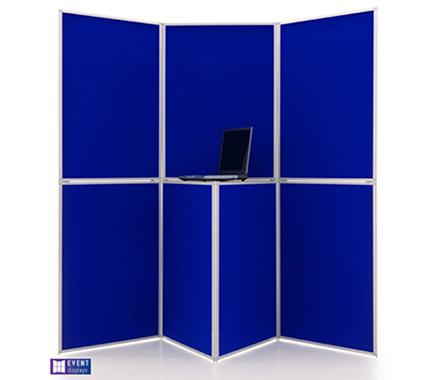 The unique addition included with the 7 panel folding displays is the integrated plinth, which is excellent for adding an electronic device or promotional material to your display. When manufacturing our display boards, we focus on creating a product which is practical as well as effective at exhibiting your content. The materials used are of high quality and are suitable for use in indoor environments such as exhibition halls, trade shows, shopping centre displays and more. These materials also ensure the display boards are sturdy, which means they can comfortably be used as a backdrop for your content. At Rap Industries, all the display boards we offer are made to order, which means each feature can be personalised. This provides you with control over the fabric colours, the material used and any accessories to integrate. All of this is done at our premises in Peterborough, Cambridgeshire. As is standard with all of the products we produce, there is a manufacturer's guarantee included.